Being a daredevil – The moment you start the game, you’ll be going off jumps and pulling tricks like its no tomorrow. The more you rack up, the more points are given and you’ll gain boost to go even faster. The amount of tricks you can pull of is ridiculous and try flipping as much as possible in the air. But there’s always a caveat: the landing. Mess that up and you’ll see Joe take a mighty tumble from either a misplaced spring or a shark pool. At every possible jump, you’ll want to go as high as you want and Hello Games have left Mr. Danger up to you in order to control his fate and the fun never ends. Whimsical presentation – The opening cut-scene is mostly static images of Joe’s life but the narration doesn’t discredit its charm. Once your in the menu with the fast-tempo theme song, you know you’re in for a treat. Even the pause menu has amazing music! It’s jumpy, acoustic with nice twinkles of keyboard and percussion. The graphics are wonderful from the mole that announces each race to the crazy amount of background animation. Hello Games made sure to pay close attention to everything going on during a level and it surely paid off. 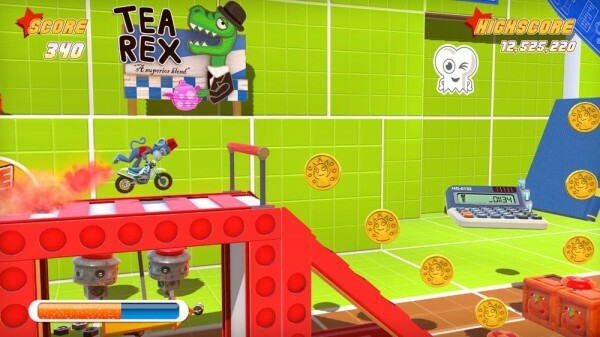 Tons of unlockables & competition – The original Joe Danger had a fair share of great unlockable content which has only seen it grown through Special Edition. There’s a whole separate section called the Laboratory which focuses more on precise platforming similar to Trials HD. There’s still the regular Career Mode which has you completing all the objectives in a level with even a chance at the brand new Pro Medals if you 100% the level. Not to mention at the end of every level, they throw your friends scores in your face. This further implements the “one more game” notion to further better your friends and trust me, you won’t stop until you’re on top. No online multiplayer – There is split-screen play for up to 2 players for races, stunts and the like but where is the online multiplayer? This wasn’t implemented in the original game so it’s a gigantic bummer that it’s not in Special Edition. You can still share custom-made tracks with all of your friends but sometimes you just want to race with a friend and see who can pull off the most tricks. It could be said that it’s a much better single-player game than multiplayer but not having any online further impedes it and just feels like something left out. But at the end of the day, Joe Danger: Special Edition takes the physics of Trials HD but adds more depth to the gameplay and presentation. It’s a solid motorcycle game with excellent replay value that’ll keep you coming back to unlock every bit of content. While not playing with your friends online is a bummer, you can still send any crazy track creations to anybody over Xbox LIVE and it’s pretty great in local since you’ll want punch your friend for getting a higher score. 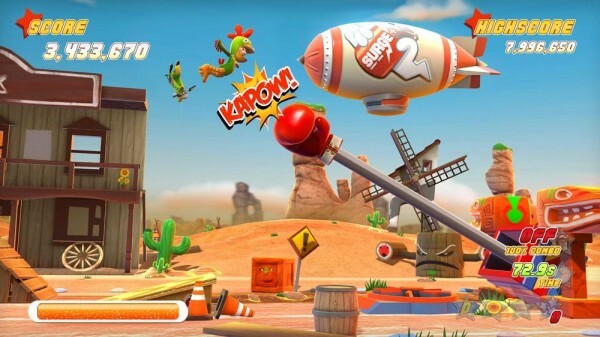 Now that we’re waiting for Joe Danger: The Movie next year, playing the original will give you a great sense of what to expect in the future. 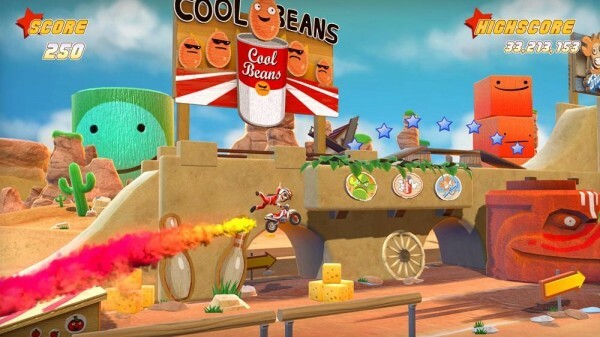 Joe Danger’s stop on XBLA has solidified his fame and we can’t see wait to see him on the big screen. 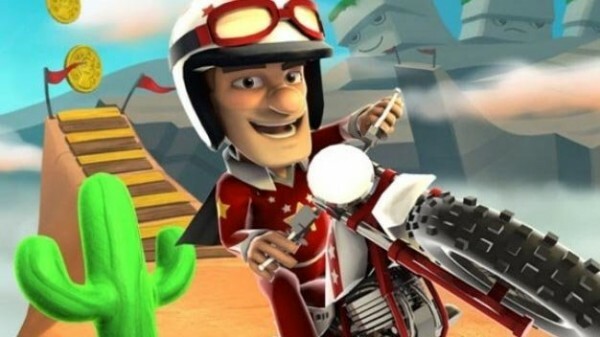 racing Microsoft Studios joe danger: the movie hello games joe danger joe danger: special edition motorcycle.